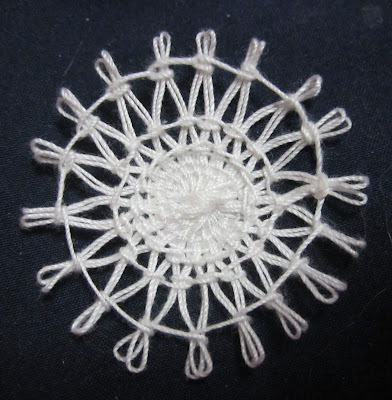 Snowgoose is a great company to buy from and they have a variety of lace supplies that are hard to find as well as kits. Since I last saw my teneriffe tool all I had done was to thread through the holes. I had never actually started a motif. So Yesterday I found the instructions and the loom again. I had found one or the other for years and I knew I had to try making some lace before I lost something again. The first motif I made was very simple in fact so simple it is barely holding together. So I started another motif using the book pdf file for instructions. I had made the second motif the wrong size so I couldn't make all the rows in the pattern but it did look nice. The second motif was 2 inches woven with size 20 crochet cotton. 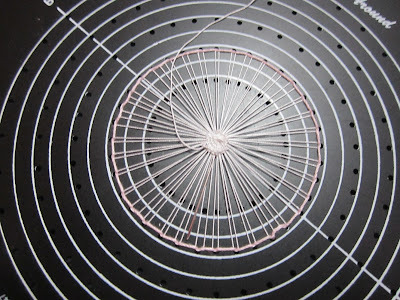 The best thing about the Stitch-Around is that by using different rings on the tool the motif size changes from 2 inches to 6 inches. So I wove the threads through a 3 inch setting and now have two much space because I used a much finer silk thread. It is hard to see so I may wait until tomorrow to finish it. Third motif still on Stitch-Around. Looks like I just need to practise making motifs to get the hang of sizes of thread to motif size. One project in the teneriffe book is a small mat made of 5 motifs, I would like to make it as a gift. Of course what I really want to make is a mantilla, which was at one time traditionally made of Teneriffe lace. I first saw a mantilla in college, Teneriffe was taught in the general needle arts class. 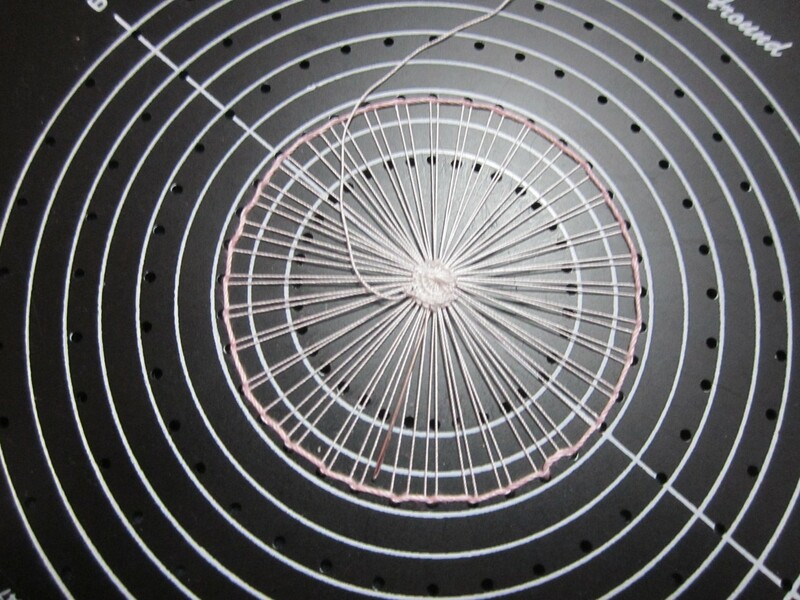 But this was long ago when it was not as easy to track down needle art tools. So we learned using pins to weave around. This method can be very frustrating as the threads try to tangle everywhere and it takes a while to set up the pins. So I didn't have a piece finished for class but I don't remember anyone else finishing a motif either. I am very proud that I was able to make my first two motifs and I will at least make a mat or decoration for a pillow. 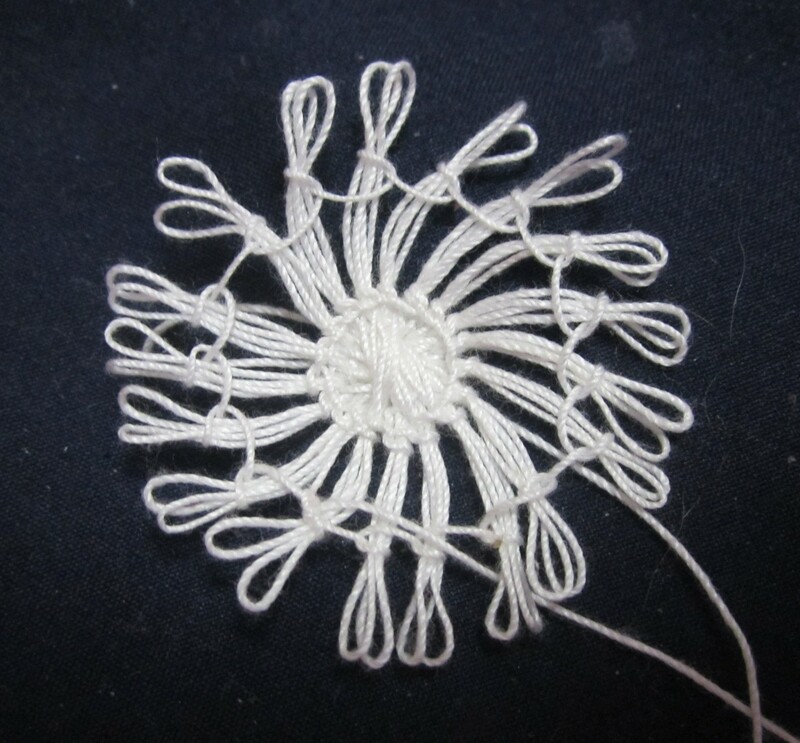 I also have an idea of using teneriffe motifs to form lace flowers, they would be pretty with the ribbon roses from earlier blog entries. I almost forgot that in the 60's there was a tool called a knitwit. It was a little handheld tool that had spokes that were retractable. You wrapped yarn around it and then popped off the motif. The knitwit made daisies and it was often called daisy work. It was a very very primitive form of teneriffe work. I have some old instruction books on making daisy layettes. I had started an afghan but the daisies were so small it was just to big a project. I would love to get another knitwit, about 5 years ago they were popular for a short time. Maybe one of these days I will make a daisy afghan! Here is a link to an instruction book from the 50's. 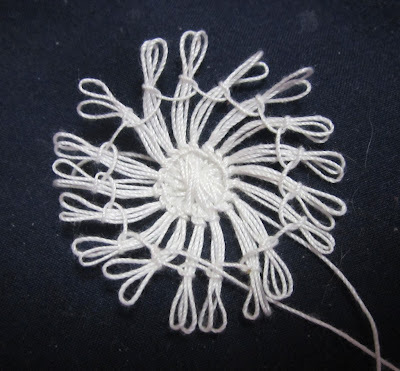 I hope that this has inspired someone to try this form of lace.